When you’re choosing your kayak, you may not always think about how you plan to transport it. But choosing the right car can be important. 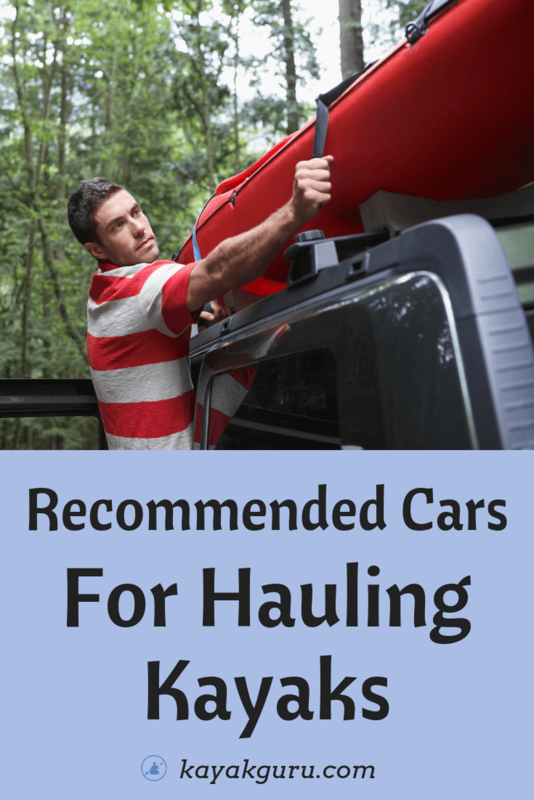 So when it comes to cars, you may find that some perform better than others for hauling kayaks. We know a car can be a pretty big purchase, so it’s best to do a little research before you hand over your cash. To give you a helping hand with the research, we’ve looked into the best cars and SUVs for kayakers and we’ve made a note of our favorite ones. SUVs can be ideal for carrying a kayak on the roof, as many of them come with roof rails as standard, allowing you to easily install crossbars. This means you can then install kayak carriers to help keep your yak safe on the roof as you travel. The Chevy Tahoe can give you plenty of room inside for all your gear. It features 7 seats, with the rear two rows able to fold down to let you store even more gear. The built-in roof rails make it easy to install crossbars and kayak carriers. It also has enough power behind it to tow a trailer if necessary. Another handy feature is the 4 wheel drive, so you can cross over rugged terrain to get to your launch site. The Jeep Grand Cherokee can be a good choice if you do a lot of off-roading, as it has a Traction Management System that allows you to select the terrain you’re driving on. As well as its 4 wheel drive, this can mean better performance, such as on sand and mud. The Grand Cherokee also comes with roof rails as standard and has a spacious interior and room for 5 passengers. Pickup trucks can be an obvious choice for people when they consider hauling a kayak. Often people can load them into the bed of the truck, strap them down and head off. But a truck can also be used to haul kayaks on the roof. The Dodge Ram comes in a range of sizes, with bed lengths up to 8 foot long. For smaller vessels, this could be ideal if you plan to transport them in the bed of the truck. You could also use a bed extender for longer yaks. The Ram has a lot of power and comes in either 2 or 4 wheel drive, depending on the model you choose. It could also be used to tow a trailer. With a truck roof rack you could carry your yak on the roof. Estate cars can be an ideal choice for carrying your yak, as they tend to be lower to the ground than minivans and SUV, which could make loading your yak a little easier. The hatchback style access to the rear of the vehicle can also make it more convenient for hauling other gear. The Subaru Outback is known for its sense of adventure and it can be a good choice for outdoor sports. It features standard roof rails with optional built-in cross rails, so you can be ready to load your kayak and head to the water. It has plenty of power and all wheel drive but is also much more fuel efficient than most SUVs. Because it’s lower to the ground than an SUV you shouldn’t need to lift your yak up as high to load it onto your roof rack. While a small car may not be your obvious choice for kayak enthusiasts, some small cars can be just as good for getting your yak to and from the water. And often with better fuel consumption. The Kia Soul is a small car with tons of personality and it can be a great vehicle for hauling your kayak. You can easily add cross bars to the roof and you could then also install a kayak carrier to give you a more secure way to transport your yak. The Soul is a fuel efficient car and it even comes in an all electric version. DIY - Installation Of Crossbars For 2014 Kia Soul! There are many cars out there that can be great options for hauling a kayak and these are just a few of our favorites. Think about what you want from your vehicle, such as who will be riding with you and whether you’ll be crossing muddy or sandy terrain, as this could influence your options. If you’ve enjoyed reading this, share it with your friends to help them with their next car purchase. If you have a favorite car for hauling kayaks, let us know down below.